Another week done - BOOM! But, honestly, can you believe it is almost November?! I mean it was still in the 90s this week, so the temperatures may not feel like fall, but the shorter days are definitely making their presence known (BOO! Please tell me I am not the only one who wants sunshine and rainbows for 16 hours of the day ;)) Anywho, since we can't change the calendar, we might as well smile and enjoy life, right?! And one way to enjoy life is to pass along some of the things I've been loving lately to YOU so that maybe you will find out about them and possibly love them too. I have seen a ton of my vegan/ vegetarian friends mention nutritional yeast before but I hadn't ever given it a try (at least not knowingly that is). Well, when I saw it at the grocery store a couple weeks back I grabbed a bottle of it and thought I'd give it a try. I think it has a nutty or cheesy flavor and have been sprinkling it on a ton lately (from popcorn to pasta, salads to soups). It has a ton of nutrients in it (hence the day "nutritional") while tasting yummy at the same time. I think I might be able to eat this EVERY SINGLE DAY! Pasta, "chickn", Everything But The Bagel Seasoning and Nutritional Yeast - DELISH! Did you see Kelly's IG post on Saturday last week?! If not, you may have missed the announcement, but thankfully you've got me here to keep you up-to-date. She's decided to tackle her third round of #BQorBust! Not only that, she is bringing the vlog back! HECK TO THE YES! I am secretly hoping she is planning to attempt her BQ at a race near me so I can run with her, but no matter what race she tackles I can't wait to follow along on her journey! The Los Angeles Marathon made an announcement last week that I had to share! Think of it as a loyalty program. 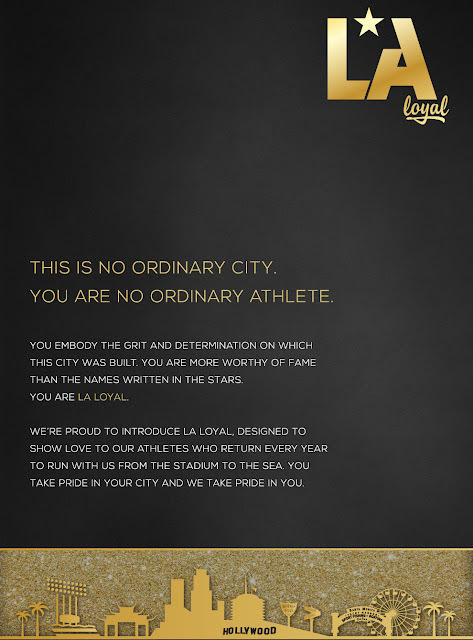 If you run two or more consecutive years, you will be given a unique "LA Loyal" bib. If you run five or more consecutive years, you will be given a limited edition shirt and travel mug along with the commemorative bib. If you run ten or more consecutive years, you will be given a limited edition hoodie and medal, along with the shirt and commemorative bib. I'm currently not registered for the 2018 Los Angeles Marathon, but it's on my radar (and if I do, it'd be the third year in a row that I'd run in). I think having a program like this is a super great idea and I hope more races do something similar! I was contacted a couple weeks ago about potentially becoming a brand rep for Raw Treads. 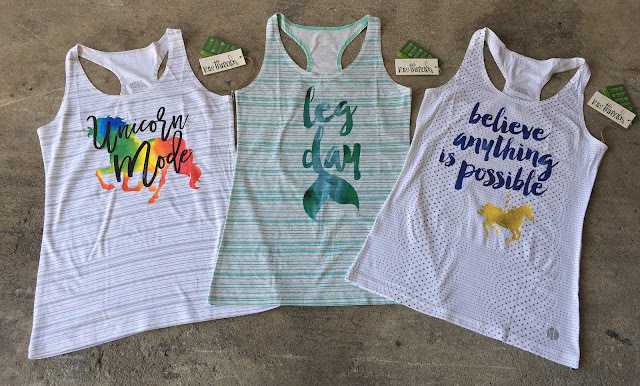 If you haven't heard of them, they are a clothing brand that believes in using a pioneering fabric combining bamboo and organic cotton with just the right amount of elastane to create a fabric that has four way stretch to move every way you do. I've always seen their gear at runDisney events and am STOKED to start repping them. My first round of tanks arrived earlier this week and I am IN LOVE! I am pretty sure the two unicorn tanks are a MUST to come with me to Boston in April, right?! Let's just start by agreeing I am not a food blogger... but I do eat food and I do blog, so why can't I blog about food?! 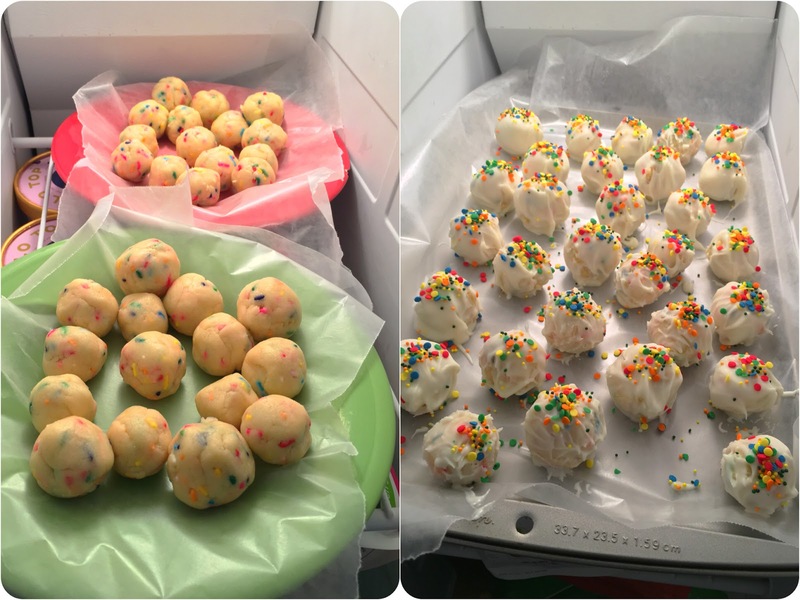 Anyway, this week it was my turn to bring dessert for our Bible study so I looked in the cupboard and noticed I had ingredients for Funfetti Truffles so I decided to make them. 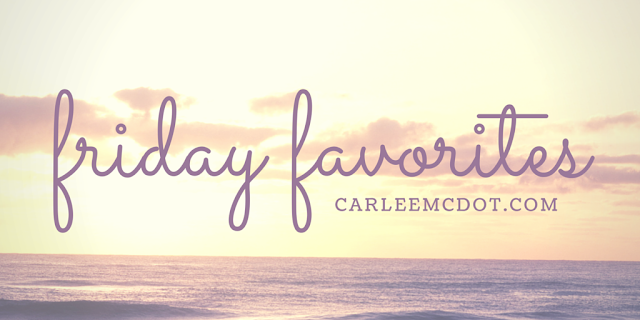 (I also made a super easy Peanut Butter Fudge, but maybe I'll share about that another day). I grabbed the recipe HERE and went to work. Everyone seemed to really enjoy these (I think they are DELISH), so I think I'll keep the recipe handy, especially with the holidays right around the corner! Yes, both of these pictures were taken in my freezer... but that's because once they came out they were gobbled up super fast! Hmm I have never had or tried a Raw Threads tank! But looks great! And I need to make a GF version of those truffles!